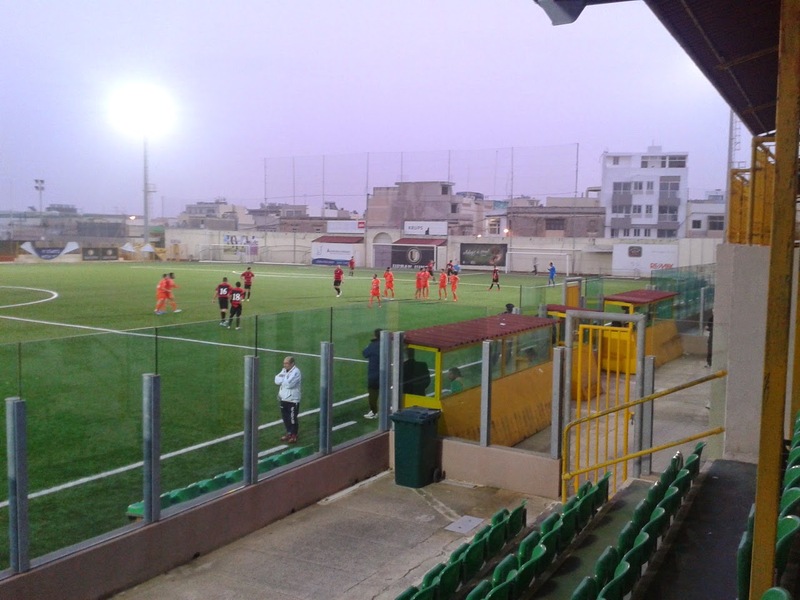 The second in a double-header of matches (which took place on 31/1/15) in Malta's BOV Third Division saw Luqa St. Andrew's take on Marsaskala at the Luxol Stadium in Pembroke. 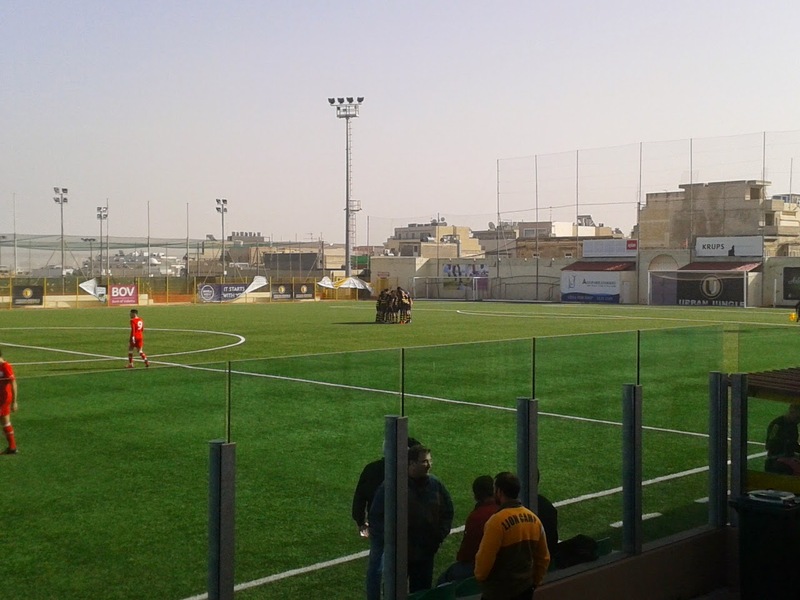 A sparse crowd assembled at the Luxor Stadium for the match between Luqa St. Andrew's and Marsaskala, a fixture featuring teams in the bottom half of the BOV Third Division with differing levels of football tradition. Luqa, a club founded in 1934, reached the top flight in 1948 for first and only time, but were relegated three years later and have never been back since. The club has won the Third Division (or its equivalent) twice in its history, the most recent championship coming their way in 2011. They were relegated from the Second Division at the end of the next season, and have been in the lower reaches of the bottom division since then. Marsaskala, on the other hand, were only formed in 2010; they finished the following season, the club's first in Maltese football, in penultimate position and the 2011-12 season in ninth. They surprised everybody by finishing the 2012-13 season in third position, which was enough to ensure their promotion to the Second Division in only the club's third season in the League pyramid. However, they were relegated at the end of last season, finishing just a point behind eleventh-placed Siggiewi. So far this season, both clubs have failed to make an impact, with Marsaskala hovering around mid-table and Luqa third from bottom before kick-off. The first ten minutes of the game were positive in spite of a scarcity of shots, with both sides approaching the situation in a positive manner. The first shot came in the 8th minute, with Marsaskala captain Justin Zammit trying his luck from distance, but his shot left Luqa 'keeper Paul Psaila untroubled. He was rather more disquietened by Denis Sytnik's free-kick from just outside the box three minutes, however; Psaila was well beaten by the Ukrainian's shot, but it thumped off the underside of the bar and was cleared. He got to another effort from Sytnik a few minutes later, but the shot was rather weak and was saved in almost slow-motion fashion. In the 21st minute, Sytnik burst into the penalty-area on the left, only to be pulled back by William Mallia; a penalty was the only outcome. Sytnik took the kick himself, and calmly struck the ball into the bottom left-hand corner, sending Psaila the wrong way to put the team in orange 1:0 up. After Marskala's Luca Nagiah received a yellow card a minute later for fouling Nikolai Slavtchev, Luqa went on the offensive, and Lydon Sciberras had their first real shot, almost capitalising on a frail fist-out from Marsaskala 'keeper Keith Dimech, but his prodded effort from 15 yards out rolled harmlessly wide. Luqa almost drew level on the half-hour, when Juan Gatt was put through, but Dimech came out and saved his shot; however, the rebound came to Malcolm Coleiro who sent his shot from the edge of the area goalbound, but Marsaskala captain Justin Zammit had retreated to cover Dimech and was able to clear the ball off the line. Luqa kept coming forward, and William Mallia escaped down the right and fired in a cross which reached Sciberras on the far side, who in turned sent over a somewhat more dangerous cross-shot which looped away across the penalty-area and behind to safety. Moments later, Luqa's momentum came to a shuddering halt when Stefan Micallef received a straight red after a crunching tackle which left his opponent momentarily prone. Team-mate Gordon Failla earned himself a yellow card for dissent; all of this was too much for Luqa manager Nikolai Slavtchev, who lodged his own protest and was invited to watch the remainder of the match from the stand at the referee's behest. They quickly regained their composure, and Jason Good's free-kick from a central position around 20 yards out was just inches over Dimech's bar. This was followed by Marsaskala working their way up the field, and a good ball from Steve Buhagiar on the left reached Sytnik, who beat a defender but was prevented from doing any damage by a terrific last-ditch tackle from Good. Luqa dominated the rest of the first-half, and as the first-half rolled into injury-time, Slavtchev (the player) crossed from the left, but the cross was met by Zammit, who could only head it out to Mallia, who was 8 yards out and in perfect solitude. Mallia then contrived to volley the ball wide with the goal at his mercy. The last action of the first half was also in front of the Marsaskala goal, when an admittedly poor ball from Gatt on the left-hand side was allowed to trundle on by a ball-watching Marjos Muscat, who dithered enough to allow Sciberras the opportunity to shoot; Sciberras did so, but sent the ball wide of Dimech's right-hand post. 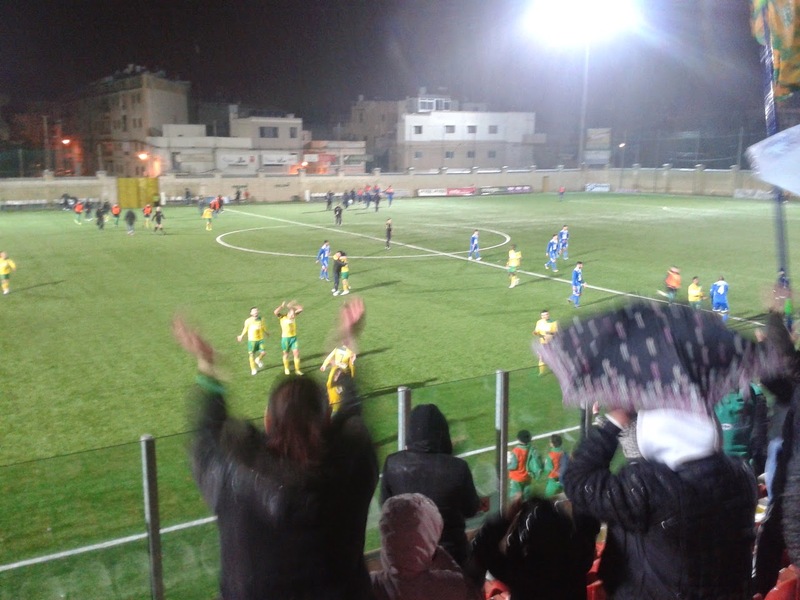 Marsaskala went in a goal to the good, but for all their endeavour on both wings, it was still Luqa with their more direct style who were looking the more likely to score a hatful, and they began the second-half on the attack. In the first minute of the second half, some pinball-style action in the Marsaskala box following a free-kick was put to an end by Slavtchev, who executed an overhead-kick from just behind the penalty-spot, only for Dimech to save easily. In the midst of all the pressure from Luqa, Marsaskala broke out of defence in the 48th minute and the ball came through to Sytnik, who gently chipped Paul Psaila from the edge of the area and sent the ball into the far corner of the Luqa net to double his team's advantage, much to the annoyance of the Luqa team, who protested that there had been a foul in the build-up; it couldn't have been offside as Sytnik was clearly onside when he received the ball. Luqa almost got a goal back five minutes later, when Coleiro was put through with the defence static; the same could not be said of Dimech, who flew out of his goal to clear the ball upfield. Next, Gordon Failla's free-kick was caught in the wind, and this almost caught the Marsaskala custodian off-guard, but he got back in time to tip the ball over the bar. Some good work on the left by Slavtchev was matched by his cross, which missed both Gatt and substitute Wayne Bussutil, but not Mallia; however, he scuffed his shot and another good opportunity was wasted. When a team misses so many opportunities, there is always the danger that they will be punished for their profligacy, and Luqa were made to pay for theirs once again in the 66th minute, though they had chances enough to prevent a goal being scored against them. A Marsaskala attack resulted in the ball being fed to Buhagiar, who was making a nuisance of himself out on the right, and he passed inside to Sytnik, who turned and shot, albeit weakly, at Psaila's goal; the shot bobbled in front of Psaila, who still managed to get something on it and direct the ball onto the post. The rebound came back to Buhagiar, who steered the ball once again towards goal, but a scramble ensued in the Luqa box and, with their defence failing to clear, the ball rolled to Sytnik and his shot, again something of a scuff, beat Psaila at his left-hand post. Not pretty, but pretty effective; Sytnik had his hat-trick and Luqa, with more than 20 minutes of the match to go, were subdued. Marsaskala broke clear once more in the 70th minute when Buhagiar received the ball at the edge of the area and proceeded to round Psaila; as he was about to shoot, he was barged off the ball. Claudio Pace then got to the ball just ahead of a Luqa defender, but he was the victim of a desperate tackle and, with the ball eventually rolling away to safety, both he and Buhagiar were prone. Mallia had the chance to give Luqa a glimmer of hope in the 74th minute when he found himself surrounded by nothing but air at a corner-kick; despite being unmolested, he could still do no more than head the ball over the bar from four yards out. Former Dynamo Kiev academy man Sytnik was looking for his fourth, and Buhagiar's pass with 12 minutes to go gave him the chance to get it, but his run and attempted shot were thwarted by Psaila who had come some 10 yards out of goal to block him on the right-hand side of the penalty-area. With two minutes of normal time left, Farrugia Spiteri was the recipient of a ball played in from the left and, collecting the ball some eight yards out on the right-hand side of the penalty-area, took the ball on a circuitous route past a defender and squeezed the ball past Psaila at the near post for Marsaskala's fourth of the match. It was a very effective performance by Marsaskala, who should be largely thankful to Sytnik and Buhagiar for the win, though Claudio Pace looked lively throughout and Justin Zammit was effective at the back. Luqa SA, however, have had a difficult season and their inability to convert their chances, plus possessing a frail defence, does not bode well for the remainder of the season. Having Micallef sent off just past the half-hour mark obviously did not help matters, but the forward line kept plugging away. Good, Sciberras, Gatt, Mallia and Coleiro put good shifts in for their team, but for little reward as the points, and the match-ball, headed back to Marsaskala. UPDATE: Both teams' bumpy seasons have shown no real sign of improvement since the above match was played, and although Luqa SA defeated Ta'Xbiex 1:0 on 8/2/15, they lost 2:1 to Mgarr United on 21/2/15. 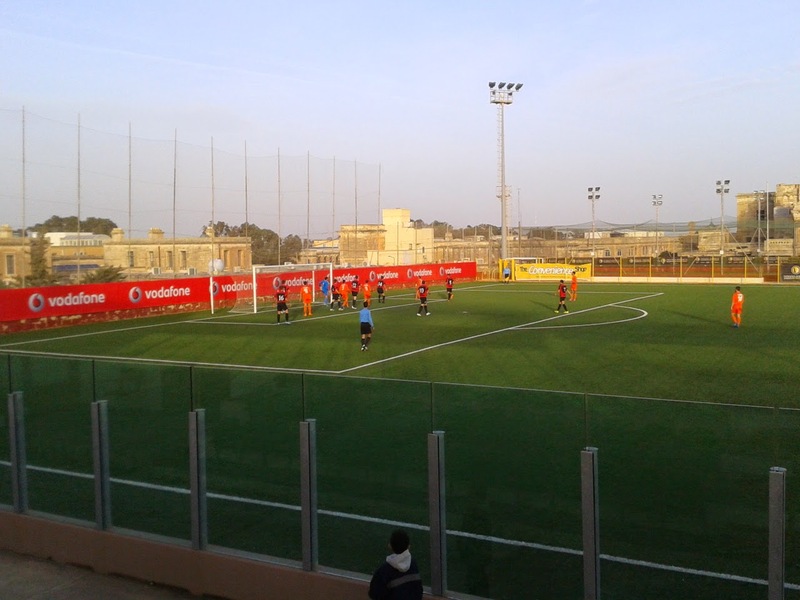 Marsaskala lost 2:0 to Santa Lucija on 8/2/15, and drew 2:2 with the once-mighty Marsaxlokk on 21/2/15. AUTHOR'S NOTE: Many thanks go to the MFA matchday staff, to Joe the gate-keeper and the friendly (female) Marsaskala supporter for their assistance. Thanks, too, go to the Marsaskala staff and Steve Borg, unofficial media rep for the club. As ever, any errors/omissions are the author's own. 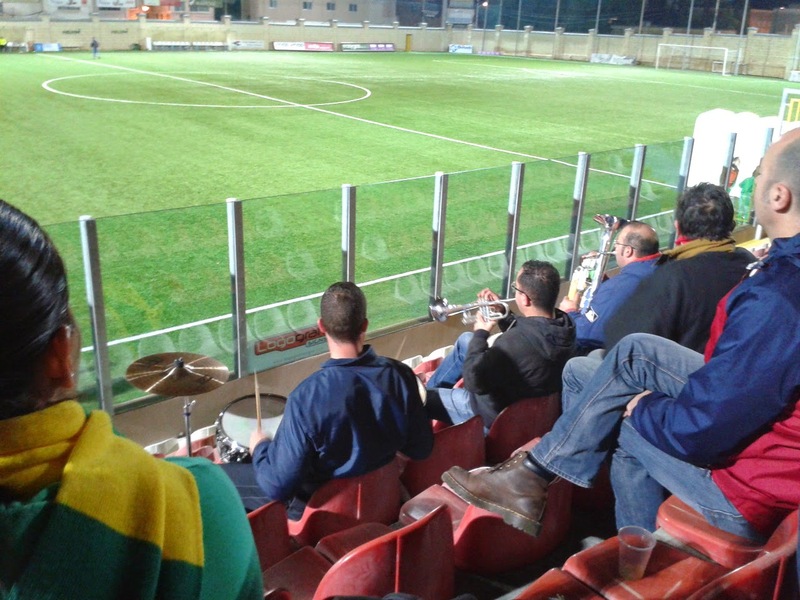 Two matches at the bottom of Malta's BOV Third Division took place at Pembroke's Luxol Stadium on 31/1/15, the first of which involved Mdina Knigts, who of course were featured on this blog last year during the previous sojourn to Malta, and bottom of the table Ta'Xbiex, the newest League club in the archipelago. Pat's Football Blog was there to view proceedings. 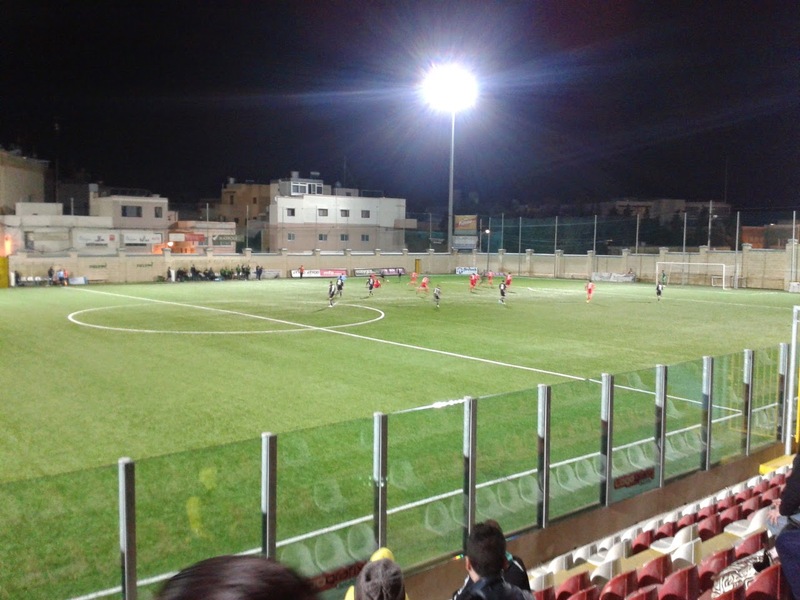 One year ago exactly, on 31/1/14, Pat's Football Blog covered a match in Malta's BOV Second Division between San Gwann and Mdina Knights, which was won 2:1 by the former. How times have changed. San Gwann finished last season three points from promotion after losing two of their last three matches, but are now two points clear of Hamrun Spartans at the top of the Second Division. Mdina Knights were relegated at the end of a dismal season, eventually finishing bottom of the pile with just ten points, some eighteen points from safety. Now, the Knights, founded in 2006, were due to take on Ta'Xbiex SC, the newest club in the League system, which was formed in 2012. 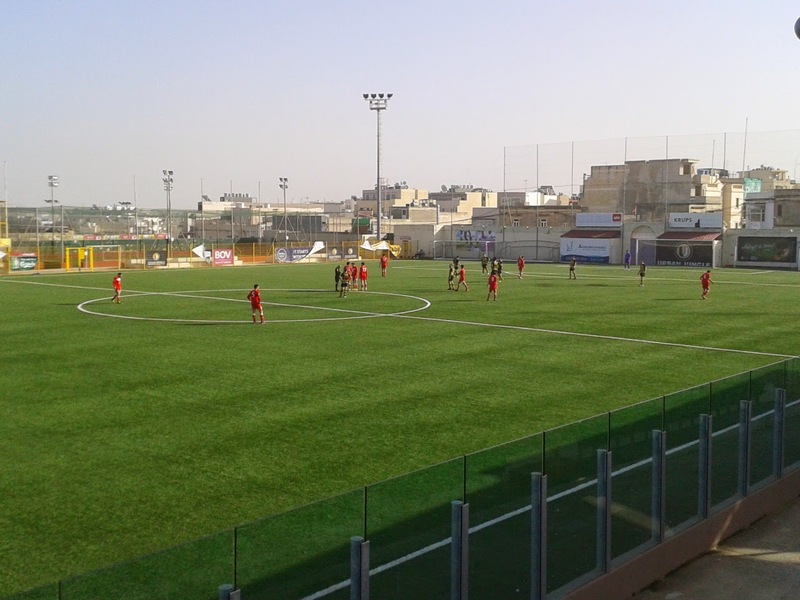 Football has been played by teams from Ta'Xbiex, one of Malta's smallest communities, since 1953, but Ta'Xbiex FC, predecessors of the modern club, were formed in 1975 and rose to the third level in 1978. Sadly, after dropping back down to the bottom level shortly afterward, they experienced more lows than highs, and, after finishing bottom on a number of occasions and having to apply for re-election on a number of occasions, they were finally jettisoned from the Maltese League during the first decade of this century. Ta'Xbiex SC finished bottom at the end of their first season in Maltese football, 2012-13, and third from bottom last year. This season, they are currently bottom, but, apart from a couple of thrashings by joint leaders Kirkop United, have lost the majority of their matches by the odd goal. Whilst Ta'Xbiex had only won one match this season (against Qrendi) before this match, Mdina Kinghts have dropped like a stone, winning two matches so far during this campaign and are the division's draw specialists, having drawn seven games before this fixture kicked-off. 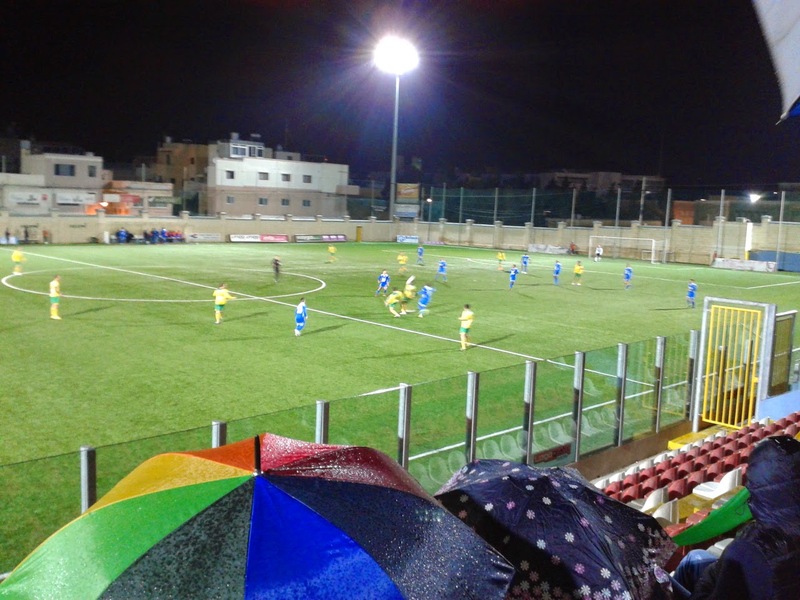 The two teams had drawn 0:0 earlier in the season, and the first twenty minutes of this match did not suggest that it would be raining goals here, either, despite the best efforts of Mdina's Mark Saliba and Ta'Xbiex's Adrian Dominicus, who were by far the most creative players on show during that period. Mdina dominated possession but were unable to profit from this. The first real sniff of a chance came in the 19th minute, with a three-man move involving himself, Andrew Xuereb and Christian Wismayer, only just breaking down thanks to an interception by Gilbert Camillieri, who got in the way of an attempted through-ball from Wismayer to Xuereb. It was Wismayer who had the first shot on goal five minutes later, but his hook-shot from distance was saved comfortably enough by Knights' goalkeeper Mark Sciberras. A Xuereb free-kick from some 25 yards out bent around the Mdina defensive wall, but was deflected away for a corner. Nicholas Scicluna then had a couple of efforts on goal for Ta'Xbiex, the first of which came in the 28th minute when he found himself in space, but a horrible bobble caused him to shoot well wide; this was followed by another shot which went well over Sciberras' goal. The course of the match changed utterly in the 31st minute, when Saliba fouled Dominicus in a crude fashion; the Ta'Xbiex player reacted by putting his face in that of his opponent, but if contact was made, it was minimal. However, Saliba dropped to the ground as though Dominicus had shoved a bin-lid full into his face, and, amidst angry scenes on the Mdina bench which resulted in an intervention by members of the local constabulary, the Sri Lankan, who had been one of the best players on the pitch, was shown the red card. Ta'Xbiex refused to buckle, and Xuereb received a yellow card for a high tackle on Dalton Caruana. On 38 minutes, Mdina finally had a real chance to take the lead when, following a corner on the left, Matthias Micallef chested the ball down at the edge of the six-yard box, but his shot was well beaten away by Allister Buzzina. As half-time approached, Andrew Darmanin had one last chance before the interval to put the team in the hooped shirts ahead, but his shot from the edge of the penalty-area went wide of Sciberras' left-hand post. The second half began with Mdina in the ascendancy but without Saliba who flagged badly towards the end of the first half and who had been substituted at half-time; two minutes after the restart, Cachel Vella's header from way out was caught by the wind, bounced in front of Buzzina, but the 'keeper was able to get back in time to tip the ball over the bar. A scramble followed the corner-kick, which led to Buzzina being fouled whilst prone, with the ball in his hands, and Vella being yellow-carded for the transgression. Mdina kept up the pressure, and Luiz Fernando Doretto had perhaps grounds to claim for a penalty in the 56th minute when he was hauled back by a defender, but stayed upright as the ball ran out of play. An inswinging corner by the same player two minutes later was headed off the line by Keith Borg, and moments later, a neat team move saw Vella in space on the right-hand side of the area, but he failed to control the ball, which went behind for a goal-kick. Vella's team-mate Kurt Farrugia was harshly booked for handball not long after, when it appeared that the ball hit his hand. A brief moment of respite followed for Ta'Xbiex, when Xuereb worked himself into space around 20 yards from Scibberas' goal; the shot that followed went well over the bar. Another inswinging corner from Doretto in the 65th minute struck the far post; the rebound came to Adrian Galea on the edge of the area, but his shot was well off target. Vella was next to have a go, and went on a run down the left, leaving two defenders scrambling after him, but his angled shot from 15 yards out was more than equalled by a fine save from Buzzina, who stylishly palmed the ball over the bar. Buzzina caused problems for his own defence as the game entered the last quarter of an hour; he flapped at a high ball which came to Adrian Galea, whose shot was blocked. The rebound fell to Adrian Gatt, but the substitute failed to connect properly and the ball was eventually cleared. The second dismissal occurred as Ta'Xbiex attempted to counter-attack; Wismayer was in possession when he was tackled from behind by Gilbert Camilleri. It was Camilleri's second yellow card of the match, and it was now 10-a-side with 15 minutes still to play. Wismayer was put clear with 78 minutes on the clock, a clever pass from Yaya Turay finding him on the right; Wismayer attempted to chip Sciberras from more than 20 yards out, but his effort ended up in the grateful 'keeper's arms when going forward with the ball would have been a better option. Three minutes later, the deadlock was broken when, after some intricate passing, Mdina's Xuereb received the ball at the right-hand angle of the penalty-area following a free-kick. He had time to steady himself before curling a lovely shot low to Buzzina's right. Ta'Xbiex pressurised the Mdina defence, but the action moved down the other end when Xuereb scuffed his shot with two minutes left, and then, as the game went into injury-time, Vella headed against the bar and Xuereb somehow managed to head the ball wide from point-blank range. He had time to scuff another shot just wide of Bezzina's right-hand post, before Ta'Xbiex embarked on a final quest to rescue something from the game. Wismayer's 92nd-minute corner-kick was headed on towards the far post, and Turay flung himself at the ball some three yards from goal, but the ball basically flumped just wide with Sciberras and the Knights' defence at sixes and sevens, and the chance was gone. So, it was another game lost by the odd goal as far as Ta'Xbiex were concerned, though they were perhaps a litle unlucky not to come away with something due to their determined defending. Perhaps their luck will change during the remainder of the season; they do, however, need to do a little more work on their finishing, but they are certainly not far below the standard of the majority of the teams in their division. There is hope for them, still. They missed the creativity of Dominicus following his sending-off, but Wasmayer, Nicholas Scicluna and Jason Woodhead did their best to keep things moving. Mark Saliba was probably the best player for Mdina in the first-half, but Doretto was dangerous throughout the second-half, with Caruana and Farrugia especially competent in defence. A much-needed victory for Mdina Knights, then; it was just their third of the season, and it says much about their slight lack of potency up front - and their at times uneven defending - that they have drawn seven of their matches so far this season. There is some potential there, but they have not had the best season-and-a-half and will need to make improvements somewhere along the line. 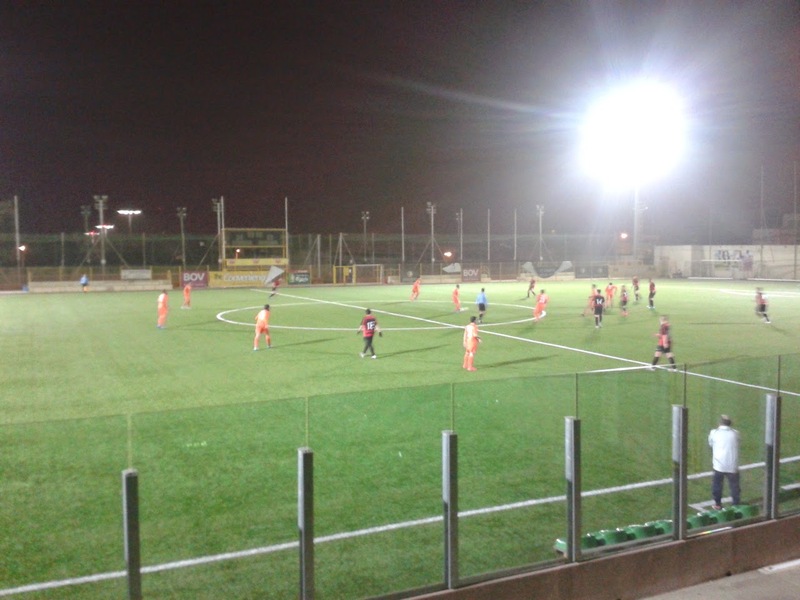 UPDATE: Mdina Knights bagged themselves yet another draw on 8/2/15; this time, it was a 2:2 draw against Mgarr United. The next game brought more misfortune for Ta'Xbiex in the shape of yet another defeat by the odd goal, which came at the hands of Luqa SA. Both teams lost on 21/2/15, when league action resumed after the quarter-finals of the FA Trophy: Ta'Xbiex went down 4:2 against Santa Lucija, whilst Mdina Knights lost 3:2 to Mtarfa. AUTHOR'S NOTE: As always, many thanks to the MFA match-day staff for providing the line-ups. Next on the itinerary in Malta was the clash of the table-toppers in the BOV First Division between Gzira United, lying third at the time, and Gudja United, who were ahead of St. Andrew's on goal difference with Gzira United a point behind. The fixture took place on 30/1/15. The top-of-the-table meeting between Gudja United and Gzira United, held at Ta'Qali's Centenary Stadium, promised much, after all, it promised much as there was a point between the two teams. Gudja were top with 29 points, level on points with St. Andrew's but ahead on goal difference, with the Maroons a point behind in third place. The fixture may have promised much, but it was a rather turgid affair in the first twenty minutes, with most of the action, such as it was, taking place in the Gzira half. Gudja, especially through Udochukwo Nwoko and Isaac Galea, constantly busied themselves with trying to find a way through their opponents' defence, but United held firm. It was certainly not pretty to watch, and the first shot in anger only came after 24 minutes through Joselito Dos Reis Santos dared to have a go from 20 yards out or so after finding himself in enough space to be able to do so, but Anthony Curmi got down to his right to gather with ease. Three minutes later, Peter Taiye Oladatun was clearly in an offside position when the ball was played through to him, but he was beaten to the ball some 25 yards out by the sliding Curmi, who could only play the ball out to George Chircop on the right, whose effort, although audacious, went well over the bar. 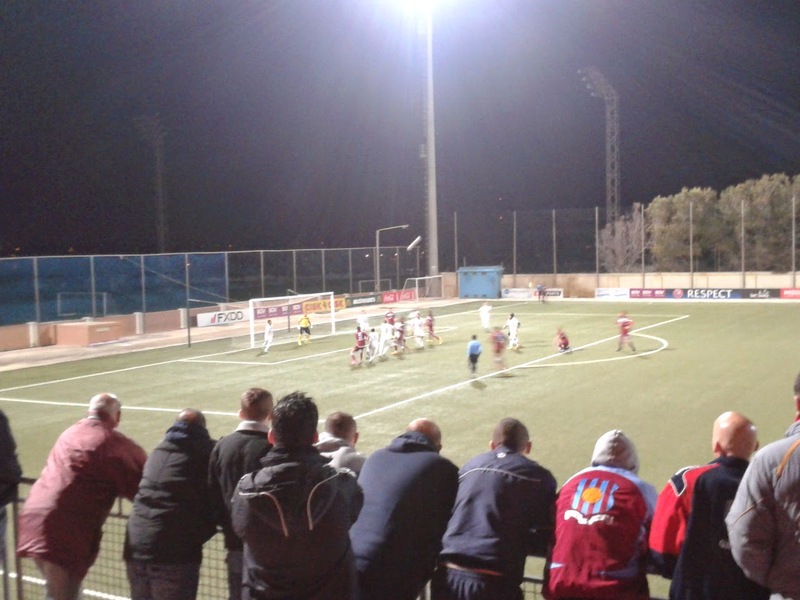 It took 32 minutes for a Maroons player to get far enough forward to try their luck, when a curling free-kick from Joselito evaded the Gzira defensive wall but floated just over the bar. A minute later, Ryan Dalli's speculative shot from way out curled just wide of Yenz Cini's goal; Cini still had yet to make a save. Gudja's Mauro Brincat earned himself a yellow card in the 33rd minute for a high tackle on Joselito after play was called back; following the tackle, the ball came the way of John Nwoba, and his shot went close, but just over the bar. A shot from Dalli from just over 20 yards out was tipped over by Cini with three minutes to go to the break, but that was just about the only thing of note to happen during the remainder of the first half. Perhaps the best way to sum up the standard of the first half was the collision between Gudja team-mates Nwoko and Joselito when the latter attempted a shot in injury-time; the ball sprang away to safety. It was a rather disjointed first 45 minutes with plenty of long balls, hefty clearances and precious little in the way of creativity from either side, though, to use a boxing metaphor, the team in the white corner were ahead on points. Gzira United started the second half with purpose, but veteran defender and ex-Malta international Jamie Pace received a yellow card in the 53rd minute for a foul on Adrian Carabott. It was all rather unnecessary; Pace hit a free-kick straight at Carabott, whom he then proceeded to clumsily upend. Alarm bells sounded in the Gudja defence in the 53rd minute when a corner was headed on by Gabriel Aquilina across to the far post, but Steve Meliak, as free as a bird on the far side, failed to cleanly connect and the ball flew wide. A Gudja attack resulted in Nwoko receiving a pass from Galea, but he lost his bearings after a last-ditch tackle from Nemanja Milovanovic, and a grateful Curmi gathered the bal inside the six-yard box. On the hour, Joselito then put a free-kick from the edge of the penalty-area high and wide. The action then switched to the other end of the pitch, and a mistake from Gudja defender Edile Micheletti Awoh allowed John Owoba to latch on to the loose ball, but Cini was awake to the situation and was able to get to the ball just before Owoba. Dalli, who was full of endeavour, cut in from the left in the 67th minute after a good pass from Daniel Scerri, beat a defender but was unable to trouble Cini with his shot, which just missed the back of the stanchion. Gudja had possibilities thereafter: first Adrian Carabott's fiercely-struck cross evaded everybody in the Gzira penalty-area and flashed across the box without anyone getting a touch on it, and then Joselito, having left a Maroons defender in his wake, laid on a cross from the right, to which Peter Oladotun got to but could only direct his header just wide of Curmi's right-hand post. Joselito fell victim to a barge from Dalli following a headed clearance in the 71st minute, for which referee Esther Azzopardi had no choice but to add Dalli's name to that of Pace in the note-book. Dalli was, yellow card or no, a shining light in an otherwise fairly dreary game, and his cross from the left two minutes after his booking was almost headed into his own net by Ranier Buhagiar; Buhagiar's header brought probably the best save of the game from Cini. A free-kick from Dalli was merely scrambled clear out to the far side but Nwoba was unable to get a proper touch on the ball. Joselito and substitute Angelo Catania both had speculative shots on goal for Gudja, but neither effort troubled Curmi in the Maroons' goal. The last real opportunity to break the deadlock came in the 91st minute, when a move involving several Gzira players led to a one-two between Eduardo Ndjodo and Nwoba was thwarted only by a poor return pass from Nwoba, which failed to reach Ndjodo who would otherwise have had a clear shot on goal from the edge of the penalty-area. It doesn't say much for the standard of fare on offer when one could consider the referee to be player of the match, but Azzopardi was impervious to the squabbling, both over her decisions and in general, which broke out intermittently, but, apart from Dalli's booking, her officiating was of a high standard. The same could not be said of the linesman on the far side, who might need to consult the rule-book having got more than one offside call wrong. However, the likeliest candidate for player of the match would be Ryan Dalli, who played with enthusiasm and verve for the full ninety minutes, even when Gzira had been pegged back for the first twenty minutes or so. Jamie Pace used his experience to steady the Gzira ship during that period, and both Milovanovic and Daniel Scerri were steady at the back. Joselito was Gudja's star man on this occasion, with Nwoko and Galea also having a good day at the office. A pont apiece was probably the most that either side deserved from this match, a match the reports of which will not fill too many scrapbooks. Still, it was clear from the start that this was a match that neither side dared to lose and as a result possibly lose ground in the race for promotion. The result was enough to move Gudja a point clear of both Gzira and St. Andrew's, who fell to third on goal difference with their near-neighbours Pembroke Athleta and Melita three points behind them on 26 points. It's tight at the top, and an interesting end of the season is in prospect. AUTHOR'S NOTE: Many thanks as usual go to the MFA match-day staff; the Times of Malta was also consulted in order to compare notes. UPDATE: At the end of this match, four points separated the top five teams. At the time of writing, this had changed to four points separating the top six, and things have changed somewhat. Gudja fell to a 4:2 defeat in their next match against Rabat Ajax on 8/2/15, whilst Gzira United beat Zurrieq 2:1 a day earlier. St. Andrew's are currently top with 33 points, Gzira United are second on 32 points with Pembroke Athleta and Gudja United on 30 points. Melita have been joined on 29 points by Fgura United. The next round of matches is scheduled to take place between 20-22/2/15. A report on Gzira United's Special Needs team will be published in the coming weeks, featuring a great bunch of kids, helpers and parents. The second match making up the double-header which took place on 27/1/15 was, to use a somewhat hackneyed cliché, a battle of the basement between Zebbug Rangers and Pietà Hotspurs, who occupied the bottom two spots in the BOV Premier League. On paper, the clash between the bottom two teams in the BOV Premier League, bottom side Zebbug Rangers - who were promoted from the First Division at the end of last season - and Pietà Hotspurs, five points above them, promised little, but there was an explosive start to, and a sting in the tail at the end of, what turned out to be a very competitive fixture between the two newly-promoted pairing. Pietà's Luke Micallef set the tone when, in the second minute and with the sparse crowd still settling into their seats, he rode a couple of tackles on the right-hand side of the penalty area and then shot from 15 yards out, but he effort was blocked by Rangers' keeper Emmanuel Bartolo. There was to be no respite for Bartolo as, seconds later, the resulting corner, taken by Claudio Francis, was headed in at the far post by Orisco Ndubisi Anonam with the Rangers defence static. The crowd was momentarily stunned, but the Blues fans quickly found their voices to acclaim Anonam's effort. The three-piece Zebbug band, meanwhile, which was entertaining one and all with a varied and skily-executed repertoire (the "band" which regularly accompanies the England team could learn a lot from them) quickly got back into their stride, which was more than could be said of their team. It was all Pietà in the early stages, with the impressive Francis shooting wide for last season's First Division champions with a snap-shot after 8 minutes, culminating a period of intense pressure, and Jurgen Pisani then shot across goal and wide two minutes later after a run down the left. Team-mate Jurgen Agius then received the game's first yellow card for a foul on Mauricio Britto. Zebbug's first shot on goal came from the resulting free-kick after 14 minutes, but Britto's shot was gathered by Pietà 'keeper Miguel Montfort. A great ball into the Blues' danger-zone from Rashid Yussuf was eventually cleared by Matias Muchardi and came to Britto some 20 yards out, but his shot was a tame one and saved easliy by Montfort. Newuche's dangerous cross from the left was turned behind by Bartolo, who was alert to the possible danger the cross might have caused, but this period of the game was dominated by Rangers, who were increasingly putting pressure on the Pietà defence. Britto had another shot on goal, but his shot was charged down and cleared upfield by the defence; after a little to-ing and fro-ing, the counter-attack led to Pisani finishing the move with a neat half-volley past Bartolo. Unfortunately for Pisani, the linesman had his flag up for offside. A couple of somewhat inaccurate shots from both sides followed, and then, with half-time approaching, Frances was unlucky to see his curling shot cleared off the line by Lee Galea with Bartolo nowhere. The teams came out for the second half to be greeted by rain, and it appeared as though the rain-gods were determined to do Rangers a favour, for they began the second half with increased vigour; half-time sub Miguel Ciantar received the ball out left after 49 minutes, dummied two defenders and beat another before shooting from 20 yards. His shot had Montfort scrambling to his left, but went behind for a goal-kick. At the other end, a cross from the left was headed on by a defender, which seemed to surprise Newuche, who was still able to put his header on target, if only into Bartolo's hands. Yussuf supplied another cross moments later for Bartolo to get on the end of, but his shot went wastefully wide, much to the annoyance of the Zebbug support. Still they pressured, but seemed destined to receive no reward as Yussuf passed to Muchardi, who saw his goal-bound shot cleared. Frances received the game's second yellow card for a foul on Muchardi as the team in yellow and green increased the pressure; on the hour, Muchardi had two bites at the cherry to bring his side level, but his second attempt went through a Pietà defender's legs but was saved by Montfort at the base of the near post. A brief flurry from the Hotspurs followed, and, after Leonardo Fortunato played the ball out to Newuche on the right, but his low, dangerous cross just eluded Newuche and a lunging Luke Micallef. A through ball from Gabriel was then picked up by Newuche, but his 20-yarder went the wrong side of Bartolo's right-hand post. Pietà's period of pressure was to prove no more than an intermission as Zebbug picked up the pace again and were more and more in the ascendancy as the game entered the last 20 minutes. A cross from Paltemio Barbetti was just a tad too high for Yussuf, whilst some good work from Jacob Borg and a nifty through-ball from Muchardi was not rewarded with a goal from Britto; his shot from the edge of the box was well saved by Montfort. Muchardi himself had a half-volley beaten out by Montfort in the 79th minute after getting on to the end of a cross from the left. Muchardi had been amongst Rangers' most creative players during the game, and his - and his team's - persistence finally paid off when, with six minutes still on the clock, he controlled a cross from Borg and, finding himself in space, found the time to sidefoot the ball low to the left of Montfort. Zebbug were level, and were in no mood to dwell on Muchardi's fine finish; the ball was retrieved and the Rangers players were eager to finish the job off as the rain finally petered out. In the last minute of normal time, they did exactly that. A Kurt Zammit corner was headed in by Lee Galea, who had ghosted in at the far post and thundered the ball into the net from 3 yards out. Now the Zebbug players and fans could celebrate, and celebrate they did. Most of the spectators present were still hiding from the rain, but the Rangers' fans burst forth from whatever cover they could find and bodies were flying everywhere in delirium as the band continued to play. A couple of minutes of injury-time were played but Zebbug kept things cool and there was to be no further pressure of note from their deflated opponents. The points were in the bag, and the win drew them to within two points of the team they had just defeated. Special credit goes to Matias Muchardi, who was at the heart of almost everything that Zebbug created; Rashid Yussuf, Britto and Galea also impressed for the winners. Claudio Francis deserves plaudits for his performance for Pietà, as does Jurgen Pisani and the busy Newuche before his substitution. This was only Zebbug's third win of a difficult season so far, but the three points, not to mention the manner in which they were achieved, should give them hope for the rest of the season. They were among the favourites to go back down to the First Division at the start of the season, but they play with heart and survival is far from beyond them. There will be many twists and turns before the end of the season, but Zebbug will need as many points as possible before the league splits into two in a few weeks' time. Ditto for Pietà, who came up as First Division champions last season. AUTHOR'S NOTE: Thanks go to James and the rest of the MFA matchday staff on duty in Hamrun; The Malta Independent was used to compare and confirm notes. 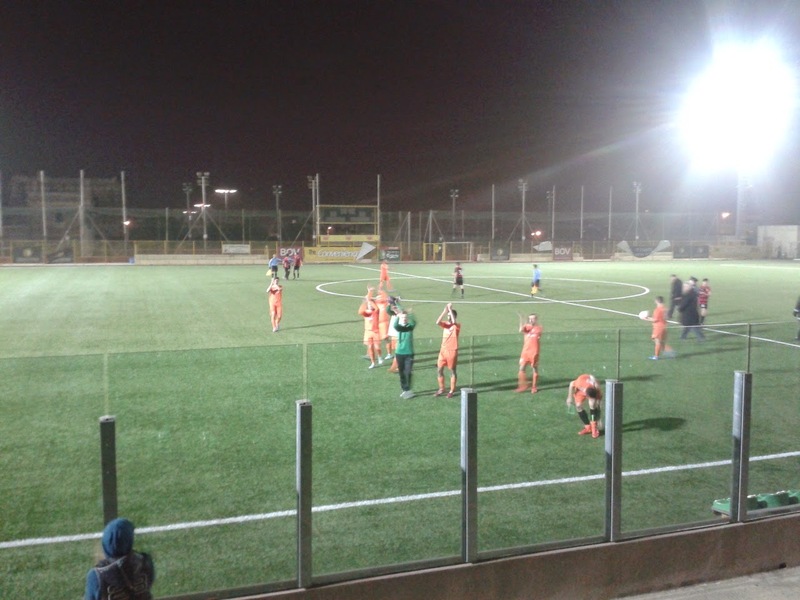 Apologies for the standard of the photos included in the article; that's what you get when your moblie carries a sub-standard camera, I suppose..
UPDATE: Zebbug Rangers won their next match, a 1:0 win against Qormi on 31/1/15, to draw level with both them and Pietà Hotspurs, who drew 1:1 with Naxxar Lions. However, the Rangers lost their next game, on 7/2/15, against the Lions, by 4 goals to nil, whilst Pietà surprised many by defeating Balzan 2:1 on the same day to move out of the bottom two. Both Rangers and Hotspurs have stiff fixtures to fulfil when league action resumes on 21/2/15: Pietà take on Floriana whilst Zebbug must face Valletta. 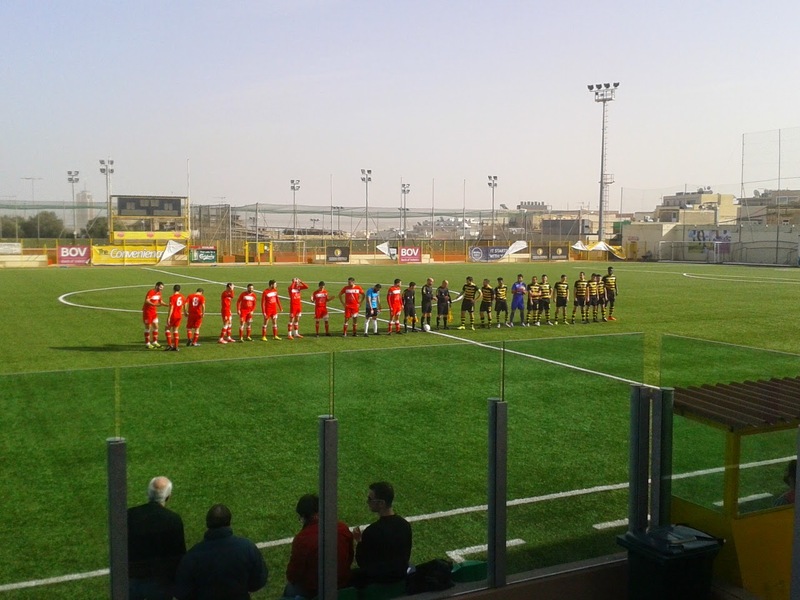 Another, more recent, visit to Malta saw seven matches being taken in, the first of which, Tarxien Rainbows versus Qormi, formed part-of a double-header which took place on 27/1/15. The aforementioned matches shall be featured here in due course. 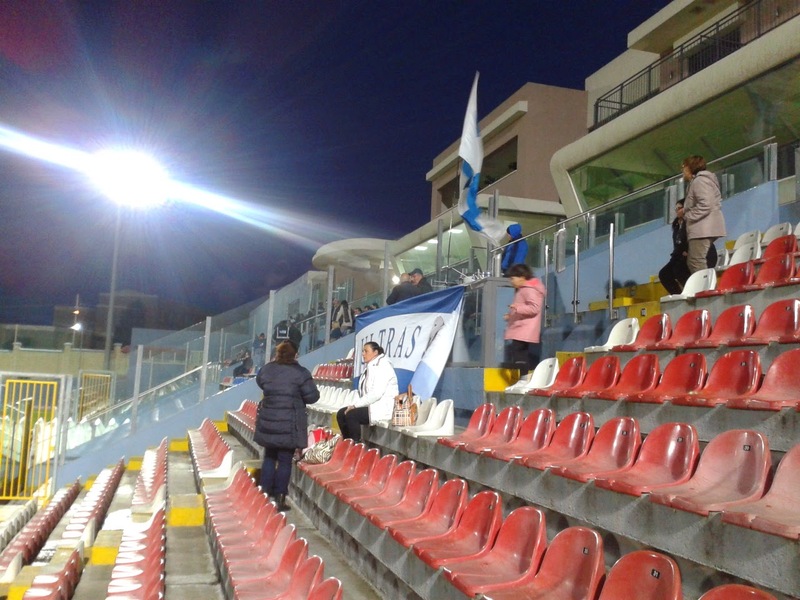 The Victor Tedesco Stadium in Hamrun was the setting for a coming together of the third- and fourth-bottom teams in the BOV Premier League, and for Tarxien Rainbows, a win was essential as they had only won once in their previous nine matches. Qormi, meanwhile, were enduring a thoroughly miserable run: they had not won a match since 25/10/14 and had lost their last five games heading into this fixture. Qormi's Frank Temile had the first shot on goal after three minutes, his hook shot from 10 yards out sailing over Jonathan Debono's goal. Tarxien went on the attack immediately, and Carlos Hevia's shot from the edge of the penalty-area ruffled the back of Qormi 'keeper Matthew Farrugia's side-netting. Tarxien had the ball in the net two minutes later thanks to Darlington Obinna's header from two yards out, but the debutant's effort following a cross-shot from Hevia on the right was correctly ruled offside. Undeterred, the team in red kept up the early pressure, and, on 11 minutes, Obinna almost got on the end of Eduardo Vallecillo Casado's cross from the right-hand side, but he was just a split-second too late. Temile then went on a one-man sortie down the left-hand side, but lost his bearings completely on the edge of the Rainbows' penalty-area, but his team-mate Alfred Effiong had more luck in the 13th minute. After a good spell of play down the right, Joseph Chetcuti stroked the ball to Effiong, who controlled the ball, dummied a Tarxien defender, turned and shot from just beyond the penalty-area, and his low shot to Debono's left put Qormi in front. Despite Tarxien having slightly more efforts on goal at this stage, Qormi were the more dangerous, incisive team and Effiong was a constant threat. He had grounds for complaint in the 20th minute when he appeared to be pulled back by Ishmael Grech on the edge of the Rainbows' penalty-area, but referee Adrian Azzopardi did not react. The reaction came from Tarxien, and it was instant. The ball went straight up the other end, where Hevia's pass was met by Obinna, and the Nigerian fired in a powerful shot to which Debono got both hands, but the ball still flew into the top corner to level the scores. Sailors' hats suddenly flew onto the pitch from the direction of the dug-out, and Obinna and Hevia obligingly donned them and saluted the small contingent of Rainbows fans. Things quietened down somewhat after the goal, shot-wise at least, but after a hefty fifty-fifty challenge in midfield in the 33rd minute, Firas Aboulezz collected the loose ball, ran on and shot from just over 20 yards, but his effort was always rising and cleared Farrugia's crossbar with a foot to spare. There were bookings for Qormi's Leighton Grech and Duncan Pisani, both as a result of fouls, and another one for Tarxien's Alexander Cini for handball, but it appeared to be more of a case of "ball struck hand" than the other way round. Not long after, Effiong left Cini stranded on the left-hand side and played a dangerous ball into the Tarxien area, but Debono was alert and smothered the ball before any Qormi player could get close enough. Temile took sufficient advantage of a poor back-header from Aboulezz, running down the right and firing in a cross, which Cini headed behind for a corner. From the corner, Chetcuti attempted an audacious overhead kick, but Manuel Bonaque Acevedo's clearance was, if anything, even more spectacular. The rest of the first half was nothing to write home about, and half-time came as a bit of a relief, though the first half had been entertaining enough in patches, with neither team being short-changed by the 1:1 scoreline. The second half began with another flurry of yellow cards. Qormi's Zoran Levnaic was the first to be yellow-carded on 50 minutes after almost taking Aboulezz's head off with a high kick, though, to be fair, Levnaic was going for the ball. Hevia received a yellow a minute later for a foul on Mauricio Mazzetti; from the free-kick, Temile appeared to be impeded inside the area, but the referee waved play on. Hevia was then joined in the book by Eduardo Vallecillo Casado for a foul and subsequent dissent. A verbal spat then followed between Hevia and Temile after a perceived foul by the latter went unpunished. Amongst all the transgressions, a football match broke out, and Temile broke down the left, beat two defenders and delivered a teasing cross, which Bonaque Acevedo got to just before Chetcuti. The ball broke to Clifford Gauci, but the Qormi man skewed his shot wide. All appeared to have returned to normal, but a 61st-minute spat between Hevia and Mazzetti on the right-hand touchline saw Hevia fall to the ground in front of the linesman as though he had been poleaxed. Whilst around a dozen players attempted to debate the issue amongst themselves in their own manner, the referee consulted the linesman, after which Hevia received his second yellow card. Tarxien manager Clive Mizzi was none too pleased with the outcome of the officials' discussion, and he imparted his thoughts to the fourth official in no uncertain fashion. Mercifully, both teams seemed to decide to concentrate on playing football for the remainder of the game, although the Rainbows, now playing with a numerical disadvantage, found themselves increasingly on the backfoot, though they were egged on by a rather vociferous female contingent. Qormi were turning the screw and enjoying the majority of the possession, but they were not creating many chances at this stage. A tasty cross from the right by Jonathan Bondin was latched onto at the edge of the six-yard box by a lunging Effiong, but the presence of an onrushing Debono appeared to have been enough to put him off, and the ball limped wide. A Mazzetti free-kick was bent around the Tarxien wall but Debono made the save to his right look easy. With twelve minutes left, a passage of play on the left-hand side ended with Chetcuti all alone with the ball some 20 yards from goal, and he let fly, only for the ball to thump off the crossbar and away to safety. Qormi's Swedish defender Billy Berntsson ambled forward for a corner-kick and almost got his name on the scoresheet, but his glancing header from four yards out flew past Debono's left-hand post. This was followed by a 20-yarder from Levnaic which went some 10 yards wide. After surviving what more or less amounted to a second-half onslaught, Tarxien sprung a surprise with 82 minutes showing on the clock. A Triston Caruana free-kick was directed to Vallecillo Cassado, and his cross was headed in at the far post from four yards by substitute Matthew Tabone; despite a valiant effort by Debono to keep the ball out, the ball crept over the line. Scenes of disbelief and joy from the Rainbows' fans were replicated on the field of play, and Tabone received a yellow card for removing his shirt. A stunned Qormi team threw everything at Tarxien for the remaining couple of minutes of normal time and 5 minutes of injury-time, during which Caruana was booked for time-wasting. A last throw of the dice from Qormi led to substitute Ryan Micallef crossing the ball into a congested penalty-area, where it was met by Effiong, but his meaty header from close range was well beaten out by Debono. 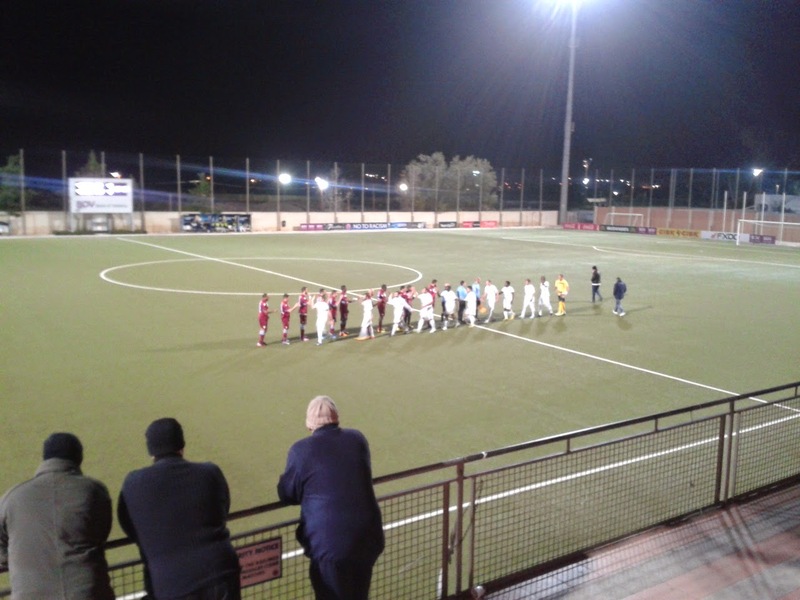 The final whistle was greeted with a mixture of joy and relief by the Tarxien team and support, but the result left Qormi's faithful with moods as black as their shirts; their team had more chances to win but couldn't take them, and this left them with no points from their last six matches. The Rainbows simply showed more grit and resolve and got their reward, coming away with a slightly fortuituous three points. AUTHOR'S NOTE: The above information was augmented with a couple of snippets from The Malta Independent. Thanks go to James and the rest of the MFA matchday team.